Blendon woods is a metropark with several trails. Some are flat and paved, others are packed dirt and gravel. There are a few loops, and some have hills and stairs. All are appropriate for small children, but carriers are recommended for tired legs on the hilly trails. All trails have benches at various intervals. Some are pet friendly, many are not. 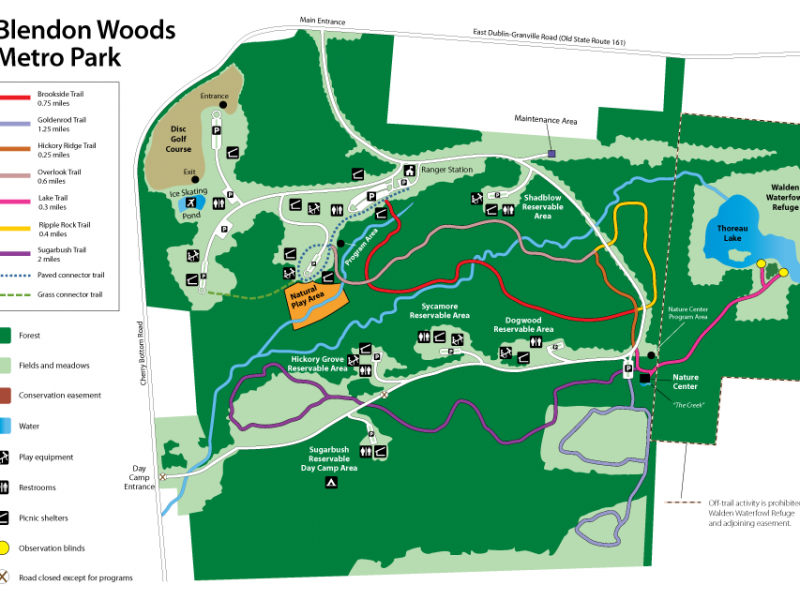 Check the Blendon Woods page at Franklin County Metro Parks (metroparks.net) for detailed descriptions and map of each trail. The paved trail starts at the nature center parking lot. Restrooms and indoor activities for kids can be found here. Many trails are near a creek, or cross over a creek. Wild turkeys are often seen here! Trails are kep well groomed even in winter. There are 2 parking lots.